Every Dinner Party starts with a first impression. Just sets the mood for an elegant evening from the start. And it does help to have a theme. 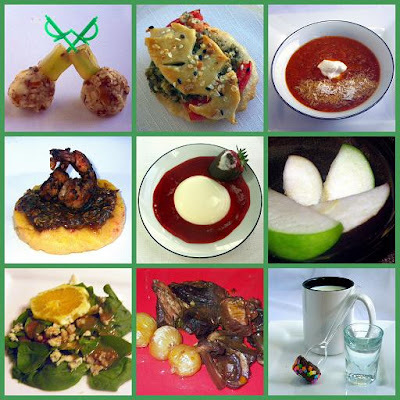 For my elegant dinner party, I was cooking dishes associated with European wine country. 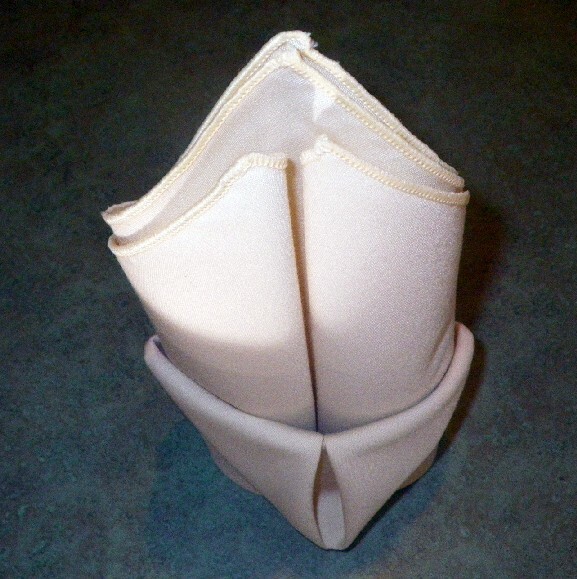 The "Fleur de Lis" was adopted as the symbol of the French Monarchy. It remains an enduring symbol of France that appears on French postage stamps, although it has never been adopted officially by any of the French republics. According to French historian Georges Duby, the three leaves represent the medieval social classes: those who worked, those who fought and those who prayed. I will add the base represents those that cook, surely the base of any civilized nation (or party). 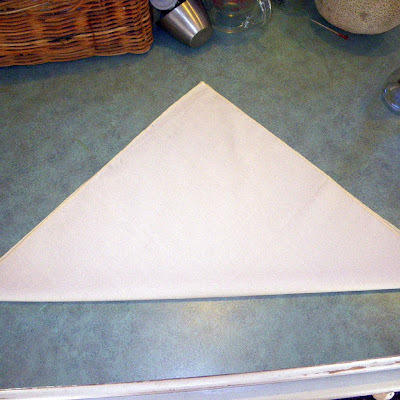 Yes, subliminal symbolism that no one directly appreciates, but it makes a pretty table and gets me (the cook) in the mood for something spectacular. Here's a little preview of what's to come this week. The food served on that table setting was a seven course meal, complete with an Amuse Bouche, and a specialty after dinner drink/treat. The dinner came off without a hitch, and a fun time was had by all (the wine didn't hurt that at all)! But, all that food will be posts for another day. 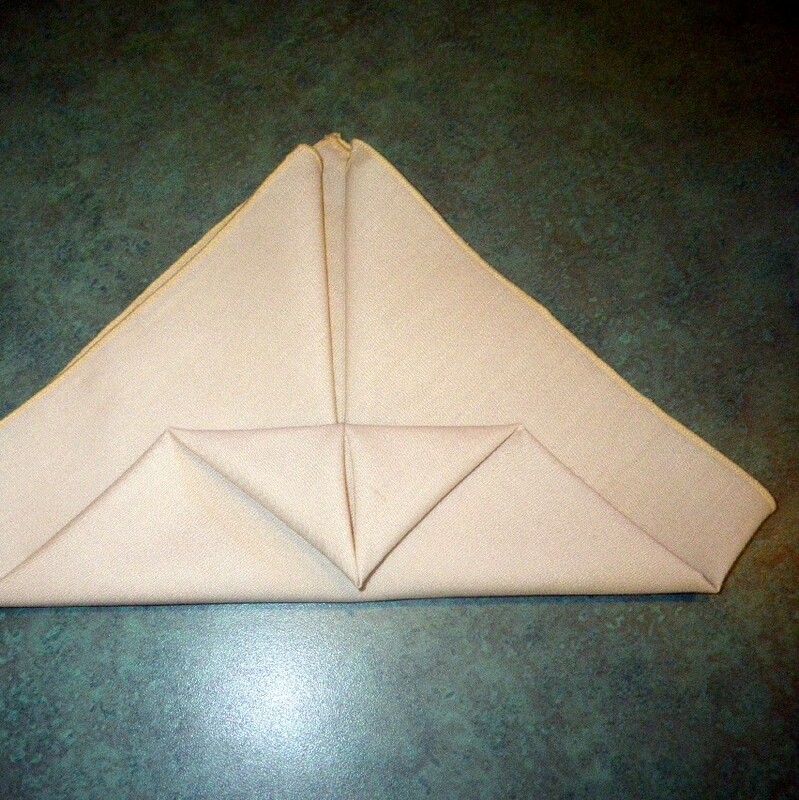 This day, let's fold a napkin. 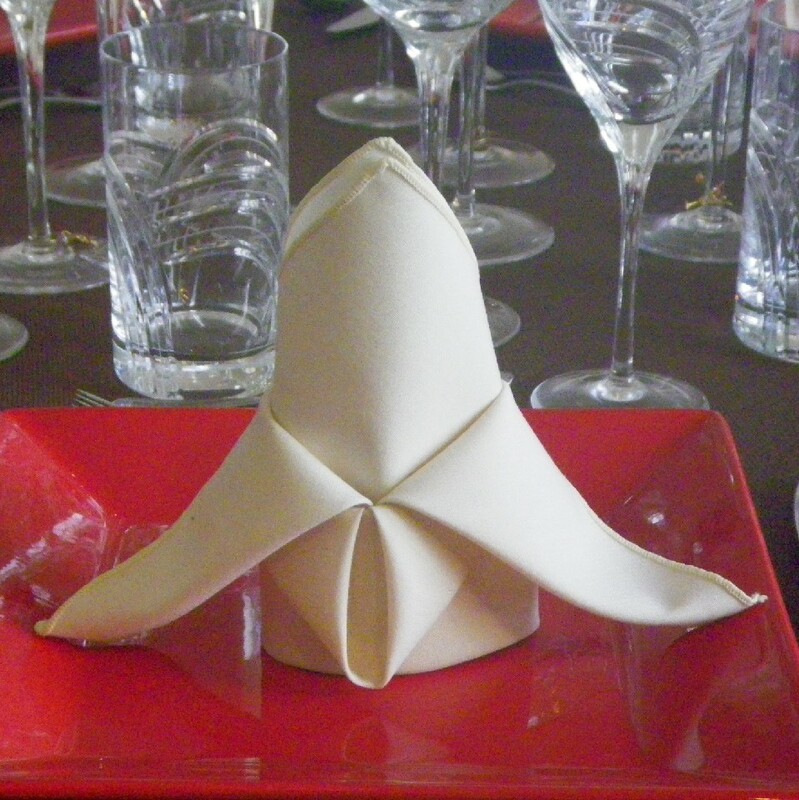 Very easy to do, very fast (after you do the first one, and it all clicks in your head); but best of all, it adds a height ingredient to a table setting that gives an elegant look. 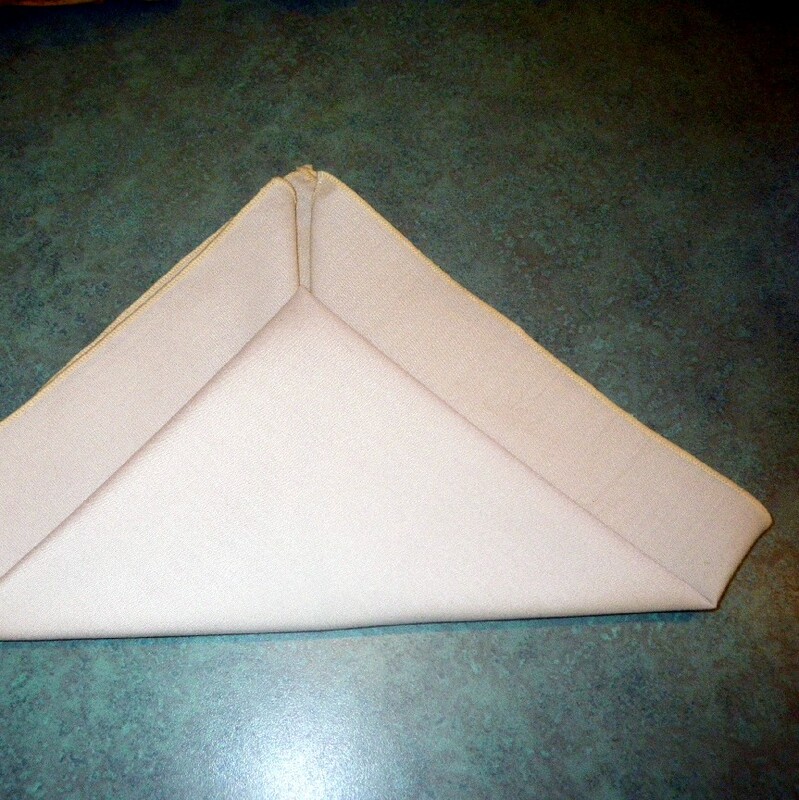 Fold the napkin in half diagonally, with the pointy end facing away from you. Fold the right-corner up so that the point rests directly on top of the middle-corner. 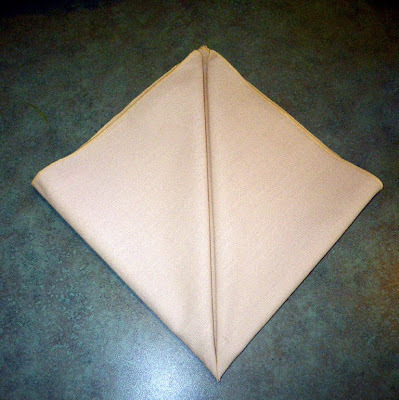 The edge of this new flap should lay on the center line of the napkin. Repeat with the other side, forming a diamond shape. 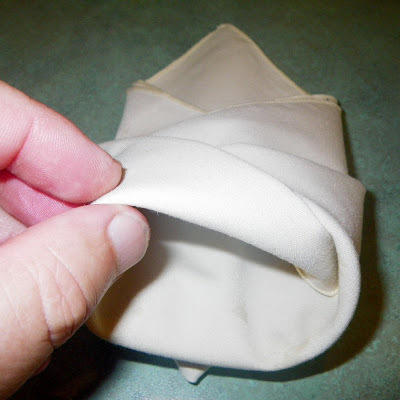 Fold the bottom up to about 2 inches short of the top. Press the edges to get a crease. 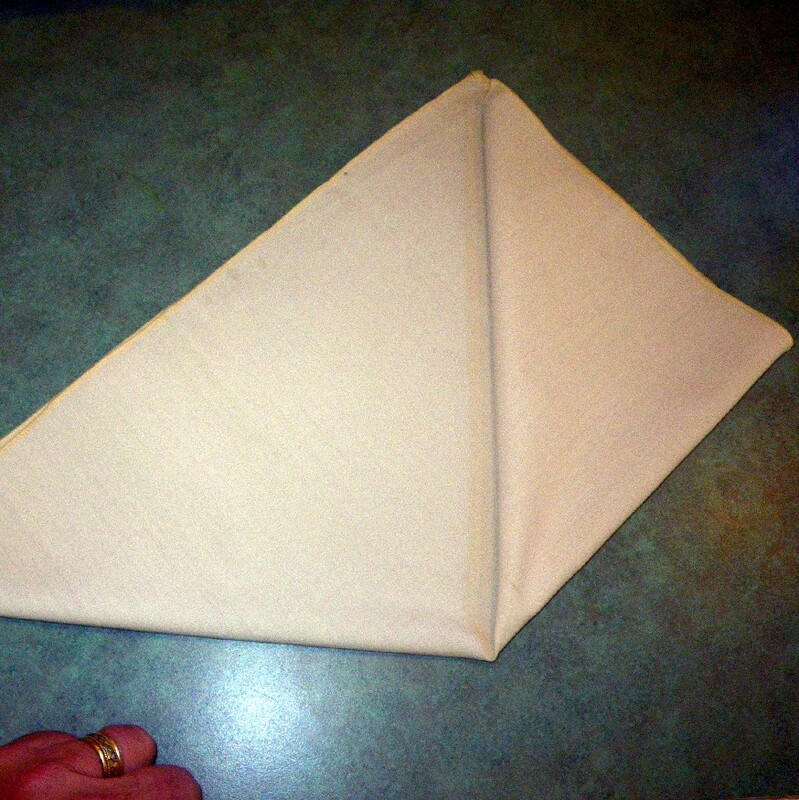 Fold the smaller triangle down so the point rests on the near edge of the napkin. Press again. 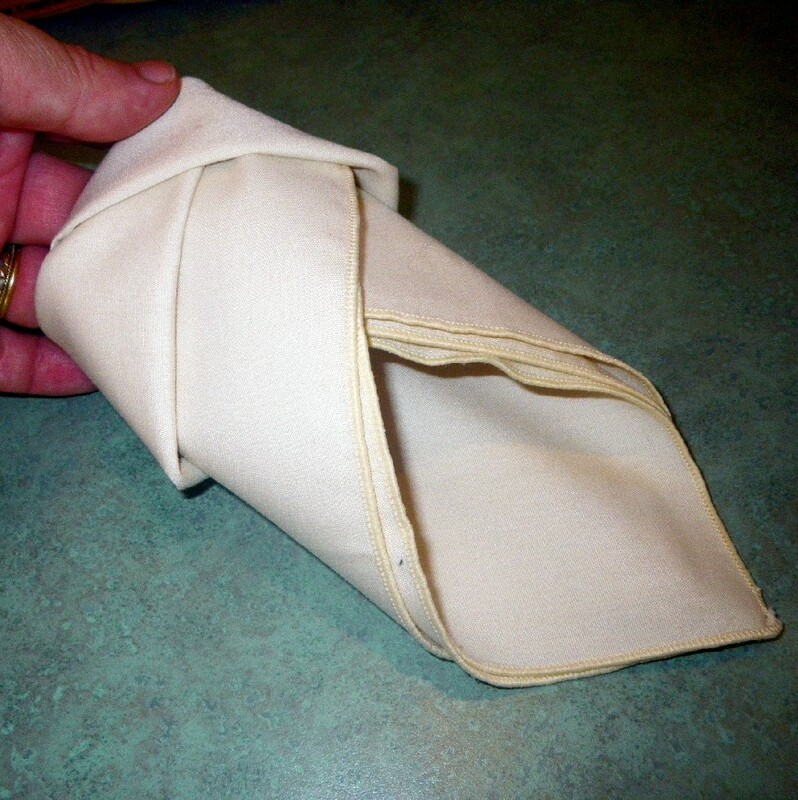 Carefully flip the napkin over with the fancy folds on the bottom. This is the only tricky part... curl the left and right sides of the napkin up so they overlap by about 2 inches and tuck one into the other. It's so tricky, here's a second view of that step with a different angle. 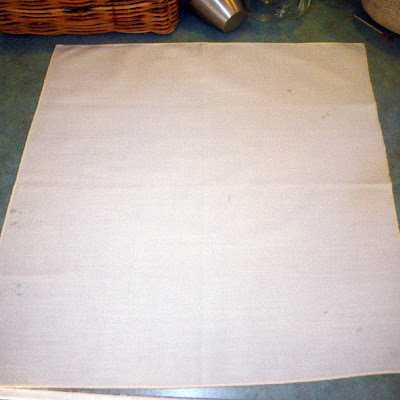 Stand the napkin up. the base is now fairly solid, so it stands easy. 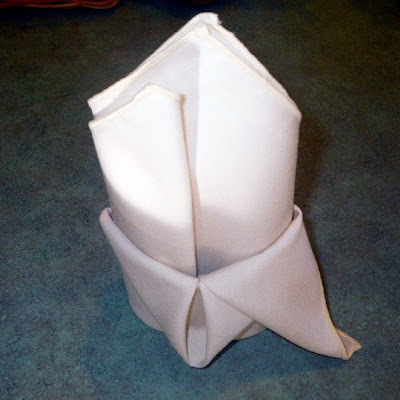 Fold the points down, leaving the Crown pointing up. 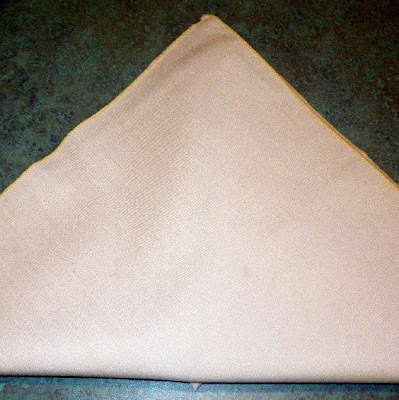 All over America, people are folding napkins this morning. I know I am. 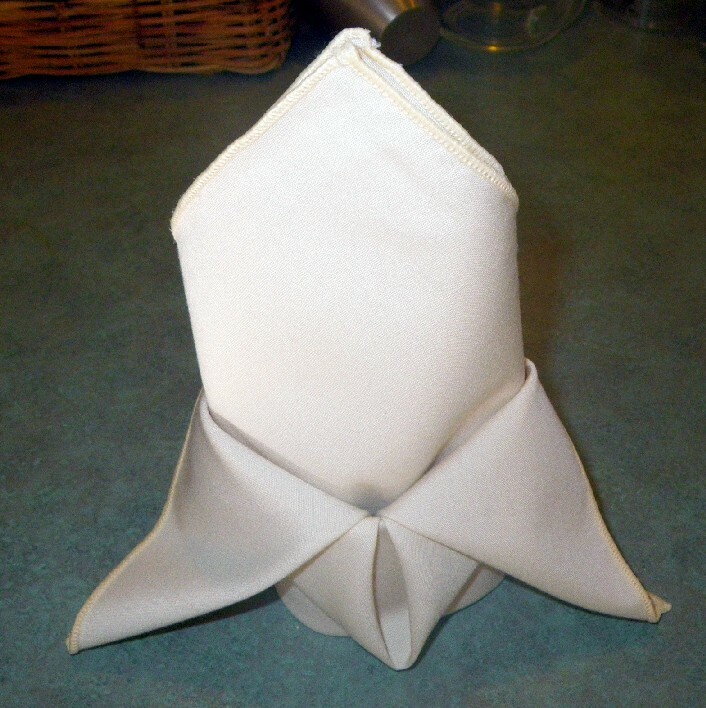 Your table looks elegant. Can hardly wait for the recipes. Nicely done Dave. I have absolutely no napkin folding skills. You've inspired me to give it a try. That food looks wonderful, can't wait to see more about it. Haha I will concede that there was absolutely NO napkin folding that went on at my dinner party. But this looks glorious. And I can't wait to see the food that went along with it. 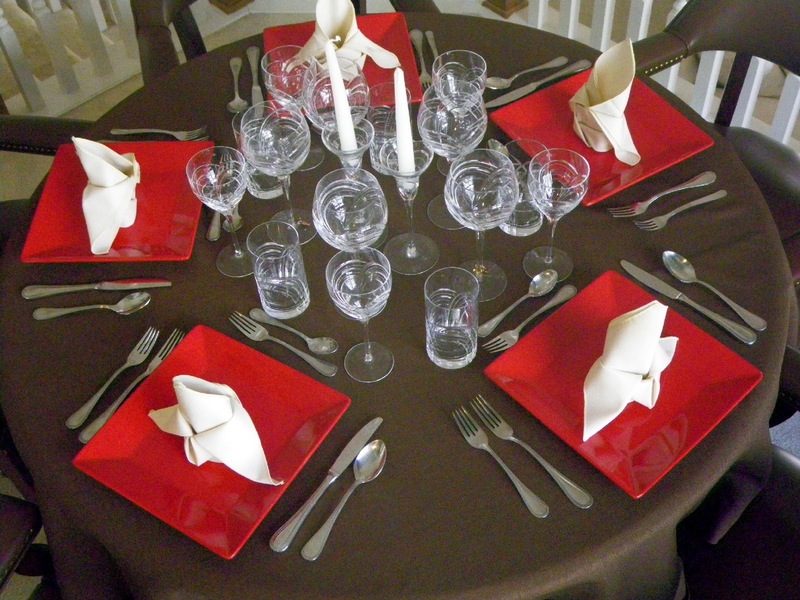 I love the color scheme of your table setting! Pineapple Jerk Chicken Wings finally grilled ! These Cookies are just PEACHY! Strawberry Panna Cotta - A Luxury Dessert?? ?